If you are considering a Lawn Care Program, we will take soil samples for analysis on the first visit. This information helps us build a profile of your site and the unique needs of your landscape. Our 100% Organic Soil & Lawn Health Care Program is designed to produce a lush healthy green lawn and restore the fertility of your soil. Find out what makes our program different. A safe environment for children, pets, and the planet! 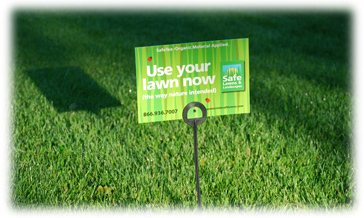 Our annual Lawn Health Care Programs consist of between 6-8 visits per year. We apply our SafeTea and other soil conditioners according to your program. All of our Plant Health Care Programs begin with an on-site survey and consultation to gather information about your location, environment, and history of the areas being considered for treatment. While on site, our trained specialists will measure these areas and inspect plants you have called attention to. As trained horticulturalists, we practice Integrated Pest Management (IPM). We specialize in the use of 100% organic products and practice the most advanced methods of organic care. This provides the healthiest choice for your trees and shrubs. Our specialized organic fertilizers work quickly to rebuild depleted soils. The humus and minerals found in our soil conditioners supply plants with a rich source of slow release nutrients needed to stay healthy. Our SafeTea foliar spray works effectively to provide vital nutrients to leaves, buds, and stems. The active beneficial microorganisms we apply help to build a naturally protective barrier against pests and disease. In nature, trees and shrubs are fed through the decomposition of fallen leaves. The home landscape does not provide this benefit. The application of SafeTea through deep root feeding improves plant vigor and boosts plant immunity. A technician will visit your property from April through October to inspect and treat ornamental trees and shrubs. We use the safest and most advanced organic methods available. 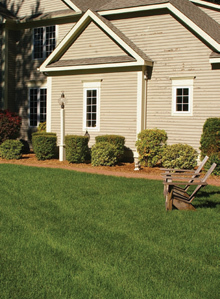 The following selection of landscape services is designed to resolve issues with thin or bare areas of your lawn. These services promote successful turf development by improving the structure and composition of the soil, replenishing the health of beneficial organisms in the soil, and introduction of superior grass varieties. Based on the results of your soil test, certain steps will be recommended to correct nutrient deficiencies, pH, or other soil properties in need of adjustment. Our living biological soil amendment is the key to unlocking the nutrients not otherwise available in the soil to feed and support the health of your lawn, trees, and shrubs. This process helps reduce compaction by mechanically removing soil cores. This will improve soil structure and allows oxygen, water, and nutrients better access to the root zones of your plants. A recommended practice to enhance established turf or to fill in thin areas, slice seeding introduces new seed and places it in direct physical contact with the soil. This is vital for successful germination. Improved seed varieties will be specified for the growing conditions present in your landscape. An application of organic compost is typically done with Core Aeration or Slice-Seeding. We apply material in either a pelletized or bulk compost form. This material introduces rich organic matter to support the beneficial microorganisms in the soil and promote seed germination.